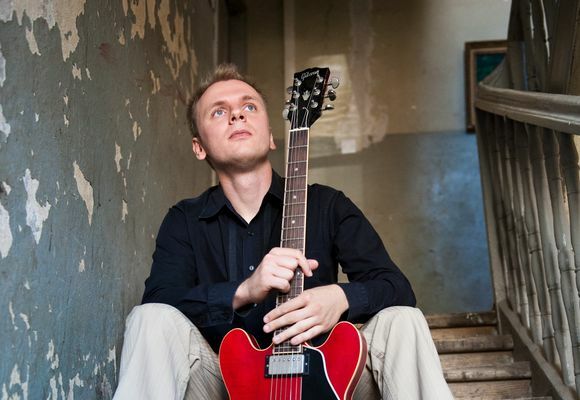 Originally from Warsaw, Poland, Rafał Sarnecki is a jazz guitarist and composer currently living in New York. He started to gain recognition in Europe after his success at the International Jazz Guitar Competition - Guitar City 2002 in Warsaw where he got the 1st award. In 2005 he moved to New York where he received a scholarship at the Jazz and Contemporary Music program at the New School University in Manhattan. In 2008 he finished his undergraduate degree from The New School. In 2010 he received his MA degree in jazz performance from the Queens College CUNY also in New York. While staying in the US in 2015 he also received a Ph.D. in composition from the Fryderyk Chopin University of Music in Warsaw. As a leader of his own jazz projects Rafał has performed in clubs and festivals in 11 European countries, Israel, China, Korea, Malaysia and has toured the East and West coast of the US. He has recorded 3 CDs as a leader. The debut album Song From a New Place (2008) was nominated for the Fryderyk 2009 Award, the Polish equivalent of a Grammy. Rafal's second album, The Madman Rambles Again, was released in 2011 by the Fresh Sound New Talent label. Dave Sumner from All About Jazz selected the album as among the 12 most interesting jazz releases of 2011 in the Editor’s Choice section. In August 2014 Rafal's 3rd CD Cat's Dream was released by the Brooklyn Jazz Underground Records. Living in the Big Apple Rafal is currently involved in a variety of groups and projects such as: Lucas Pino No-Net Nonet, Annie Chen Group, David Bertrand Quartet to list a few. He performs at Smalls on a monthly basis with the Lucas Pino No-Net Nonet.